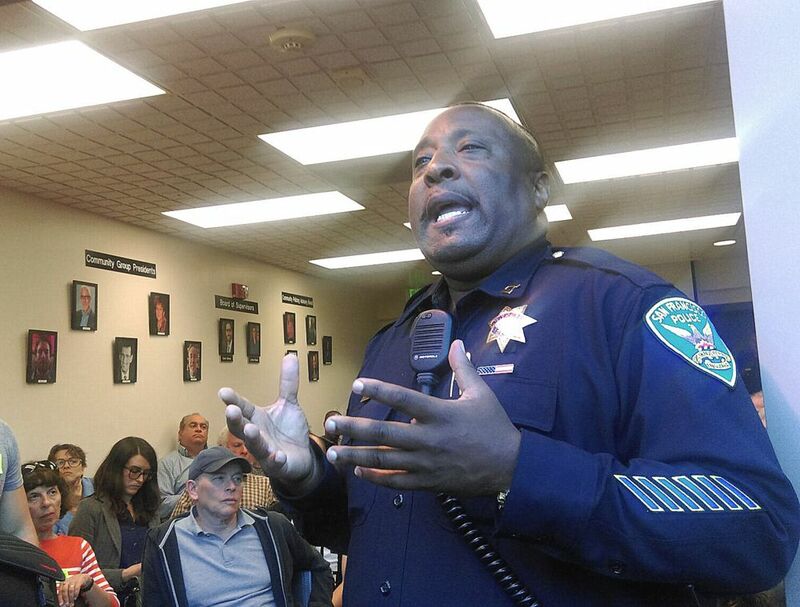 At a heated community meeting last month, a bike commuter asked SFPD Park Station Captain John Sanford whether he could expect to continue safely treating stop signs as yield signs. Sanford had instituted a crackdown on that behavior, and some ticket recipients said they were told they had to put their foot down at stop signs. Sanford confirmed to the crowd that that requirement does not exist, and insisted that his officers didn’t enforce it. Sanford then called over Traffic Company Sergeant Frank Harrell, who was in another conversation a few yards away, to consult as an expert on bicycle traffic laws. 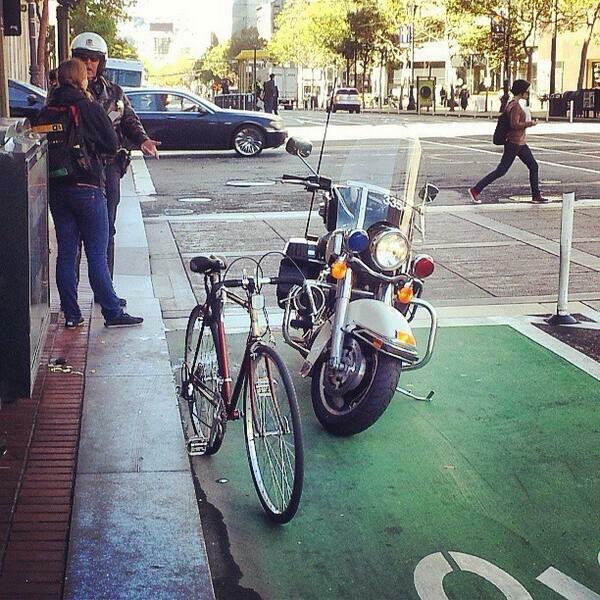 Ignorance and misinterpretation of traffic laws among SFPD officers — even the supposed experts — is a sign of the anti-bike bias that pervades the department. Bike advocates and attorneys say officers routinely fail to accurately cite the laws they enforce against bicyclists, and even fabricate justifications. “It comes up all the time,” said Michael Stephenson, an attorney who estimates officers have wrongly cited a law in about a third of the bicycle crash cases he’s investigated at Bay Area Bicycle Law (more than 1,000 of them). Cooper was one of dozens who recounted experiences with anti-bike bias at the SFPD at a City Hall hearing two years ago. Supervisors called the hearing after the death of Amelie Le Moullac, who was killed on her bike by a truck driver at Sixth and Folsom Streets, and was initially blamed by police who asserted that the onus is on bicyclists to pass to the left of right-turning vehicles. 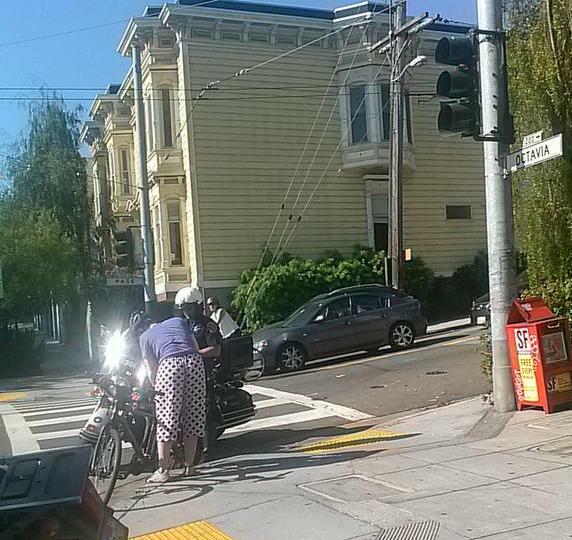 The SFPD later found that the trucker was at fault for failing to yield when making a right turn, but only after video of the crash was found by a staffer at the SF Bicycle Coalition. Although the botched investigation sparked outrage and brought political attention to the issue of police bias, the trucker was never charged by the District Attorney’s office. Nearly two years ago, the SFPD announced its “Focus on the Five” campaign to target enforcement of the most dangerous driving behaviors. But only recently has the department started to move toward compliance, and said in July that it also applies to bicyclists and pedestrians. Mannix has said recently that the department aims to target dangerous driving because motor vehicles can generally kill and maim more easily than bicycles. It sounded like progress from Mannix, who as captain of Northern Station three years ago, cited two laws incorrectly when Streetsblog interviewed her about a couple who was harassed by a driver while biking. The driver slammed the brakes in front of the couple, causing one of the bicyclists to crash into the car and suffer injuries. Mannix said the injured man could have violated the law in the CA Vehicle Code against “following too closely,” which applies only to motor vehicles. Contrary to CVC 21202, she also said the couple should have rode “to the extreme right” of a traffic lane, and not occupied it. 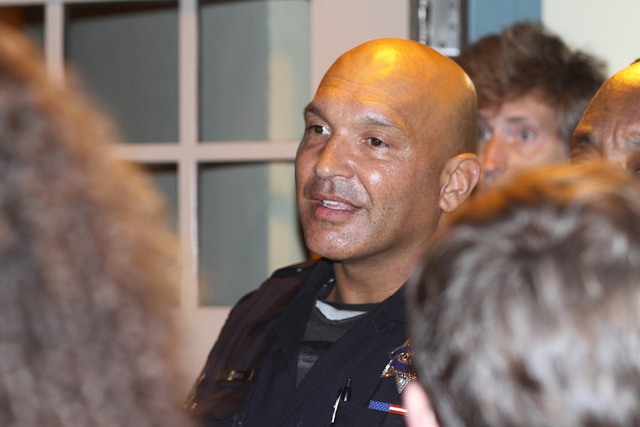 When I recently reached out for an interview with Mannix, SFPD spokesperson Albie Esparza responded. Esparza said SFPD officers must pass a test on traffic laws to pass the academy, and must “constantly receive training throughout the year” because “there are literally thousands of” laws that must be reinterpreted in accordance with recent court cases. Traffic Company officers receive specialized training in traffic laws, he said. Nevertheless, the department’s institutional bias toward blaming victims remains strong. Even in cases where drivers commit deadly violations like running a red light, police cite a variety of laws to blame the bicyclists they hit, according to attorneys we spoke with. Bicyclists hit by red-running drivers have been blamed for violations like riding in a crosswalk or unsafely entering an intersection before it’s clear. That latter law, Stephenson said, only applies to intersections without signals. Bicyclists are also often wrongly cited for passing on the left and right of stopped cars. Stephenson said police also tend to blame bicyclists for “unsafe speed” violations, even when they’re well under the speed limit, when they crash into a driver who violated their right-of-way. That happened to Nathan Dushman last month at 18th and Minnesota Streets, where a driver who had a stop sign jumped in front of his path. There was no stop sign in Dushman’s direction, but the police report included “nothing about whether I had the right-of-way,” he said. 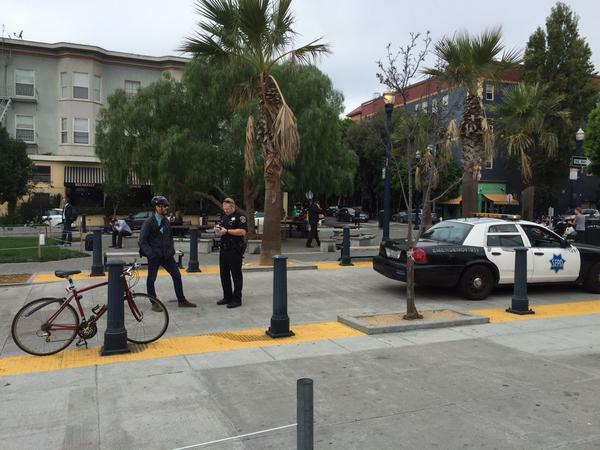 Attorneys said police often refuse to write police reports for bike crashes. Bike injury attorney Jeff Wozniak said he once had to go to Park Station to get police to write one for a client. Attorney Shaana Rahman said misinterpretation of traffic laws doesn’t seem to be “pervasive throughout the department,” but that “I think there are certain divisions that have taken it upon themselves to reinterpret the laws.” She speculated that there may be a lack of education among officers, especially about “grey areas” like the stop sign law, which even Captain Sanford doesn’t follow strictly when biking. To reduce the “pro-car bias” at the SFPD, Wozniak said every cop should be required to ride a bike in the city regularly. 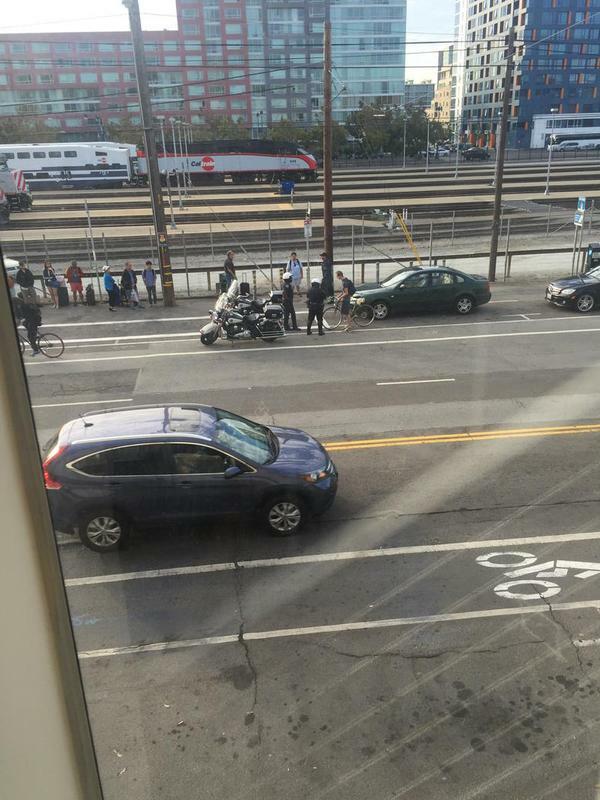 Many SFPD officers may primarily experience San Francisco’s streets from behind the windshield. Only 32 percent live in the city, according to an analysis of Census data by FiveThirtyEight. Harrell claimed Sullivan “died in my arms,” even though he got details about the case wrong. He called her “Kathleen,” and asserted she was riding in a bike lane (where none exists). Given Harrell’s warning, I asked if Sullivan’s death was her fault. “No,” he said, “but you know what? It wasn’t the truck’s fault either,” because they both “had equal responsibility of the road,” and “both had the right-of-way.” That is impossible, attorneys confirmed. Noting how confusing traffic laws can be, Harrell said he “still doesn’t understand” the new car restrictions on Market Street. “I just ad-lib,” he said. Bicyclists won’t yield. They already don’t yield, and it is against the law. They won’t be more likely to yield if the law is relaxed. Please, provide the data. Thank you. Are you really that psychotic that the voices of over 140,000 people don’t matter? Wow. Just wow. What? Arguing with you means someone is part of the bike lobby? What are you then, part of the “car lobby”? And if that’s your criteria, then for every opinion you have on every subject, you are now in the lobby for whatever political group also has that opinion. Seems kinda silly, doesn’t it? Reading your comments and inability to counter the points made against your position and just fleeing the conversation instead, your position actually seems to bolster the pro-bicycle case and make your position (which I’m unclear on: that bikes should continue to be treated as cars even though about the only thing they have in common is the use of wheels?) less persuasive. Of course, I guess I’m part of the “bike lobby”, so what does my opinion matter? I’m just saying, why would you make policy that affects the majority, just to please what can only be described as as small minority – no way around that – 17% is just not a very big percentage. I’m just trying to understand why 17% is an important number to you. It seems like the opposite of a good argument to say policy should be made to satisfy a small minority of citizens, but maybe I am missing something. The data is being a pedestrian in SF for 30 years. This is why Park Station started enforcing in the first place – complaints – not because of some vast motorist conspiracy against bicyclists. I guess all I’m saying is that in these types of discussions, people in favor of lax cycling laws don’t represent themselves particularly well. “Lax” cycling laws? They’re only lax if you think a bicycle is a car. What is happening here is that, as bicycling grows, those who use this method of transit are fed up with being expected to act like a motor vehicle since it is nonsense in almost every way, from how much power the two methods require to how many people they kill and maim to how much space they take up in our crowded cities to how much pollution they cause. This idea that making different laws for bicycles than for cars is somehow “lax” is the perception that needs to change. Making progress, by definition, requires changing perceptions and laws and this has been true for just about every major issue from smoking laws to women’s rights. Laws are not the word of god which cannot be changed and in fact the point of our society is to constantly question them and make them better. It is no secret that the unique needs of bicyclists have long been neglected in urban design (and until recently, this was because there were so few of them), so it makes a *lot* of sense to be re-evaluating them as bicycling grows and its many benefits are slowly being acknowledged while the costs of building a society around the automobile are also slowly being acknowledged. And if, in this process, people question laws that were clearly made when times were different and you have a problem with this, then I’m afraid it’s you that comes across as not looking so good. In other words, you expect us to take your word for it and ignore real data and research. I really don’t give a s***. I have no burden of proof. This comment is the answer to the question “why an Idaho stop law in SF will improve safety”. It’s not because a stop-as-yield law will inherently change bicyclist behavior, as most people biking in the city are already treating stops as yields. What it will do is make it clear to the PD what constitutes unsafe bicyclist behavior so they can concentrate their enforcement efforts on that instead of just wasting time ticketing safe, rolling stops with no right-of-way violations as they have been doing. I wish this wasn’t necessary but sadly the SFPD have shown that they are unable to apply this kind of discretion when left to their own devices. Anyone (myself included) who wants bicyclists that cut off pedestrians in a crosswalk to be penalized should support an Idaho stop law so that actual, dangerous behavior will be be targeted for enforcement. Or plenty of unmarked, uncontrolled crosswalks at intersections where there is no stop sign or traffic light. Unless signed as closed to pedestrians, these locations are also pedestrian priority. 10% of the US population is African American. Why would we abolish slavery? You’re not very good at ducking out. Then don’t expect the listener to care about your opinion. One of the founding principles of this country is that the minorities have rights and don’t just get trampled by the lynch mob. It’s not a popularity contest — we debate points of view on their own merit not by how popular they are. All that popularity is used for is electing leaders; thereafter, we judge points of view on their content. After all, all new ideas by their very definition of being new start as only being accepted by the minority, so nothing would every change if everything was a popularity contest. Bicyclists and pedestrians are being killed and maimed by the hundreds every year in this city alone and you seem to be saying their lives don’t matter since they are *only* 140,000. When you step back and think about it, doesn’t that sound pretty bad? Bicyclists are asking for the laws to change to recognize that they are patently not cars and that the current system isn’t protecting. It’s absurd that you don’t think that’s a valid point of view just because it’s not the majority. Oh come on. That’s pretty offensive. There are plenty of reasonable arguments for and against better bike infrastructure and laws that don’t resort to comparisons like this. Then quit responding. Nobody asked you. I’m not stats-obsessed; sue me. My argument does not hinge on stats and “real data and research,” – yes, you are correct! Yeah, we can tell. Go back to ducking out and let us who live in the real world, instead of the world of your paranoia about bikes, get on with realistic discussions. It’s an open thread. You don’t want murphastoe or anyone else responding to your comments, then the way to make that happen is to stop posting your idiotic comments. Wait a minute. I never made an argument nor mentioned that a 3 foot wide 180 cyclist . . . is equivalent . . . to a 2000 lb. 6 foot-wide car . . .